Automation is “releasing capacity” for Boots pharmacists to spend more time with patients and is “clearly safer”, the multiple’s chief pharmacist has told C+D. Marc Donovan has seen the evidence of technology “directly and indirectly” improving patient safety in Boots branches, he told C+D last week (September 4). “When we use automation – including pack scanning – it is clearly safer,” he said. 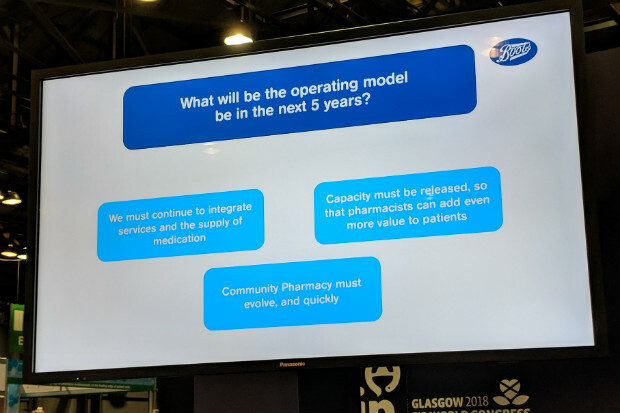 Speaking exclusively to C+D after his session at the International Pharmaceutical Federation (FIP) Congress in Glasgow, Mr Donovan acknowledged that “technological developments make people nervous in any walk of life”, but stressed that the introduction of more technology in community pharmacy is “inevitable”. “Technology is already helping us. Automation is giving better safety protocols, as is scanning products, and we're reducing mix-ups [due to] wrong product selection [with] quite a dramatic effect,” he told FIP delegates in his session. Mr Donovan told C+D that technology is just one “enabler” for pharmacy teams to spend more time interacting with patients, “helping them understand their medicines and identifying patient safety issues”. “Care is delivered by humans. We have got to get our pharmacists right next to our patients to deliver that care. “If automation releases capacity to allow pharmacists and pharmacy teams to deliver better care in our communities, it has got to be a good thing,” he added. While the “inappropriate use of technology may well lead us to riskier practice...what I am seeing at the moment is technology enhancing patient safety and providing us a platform for our professionals to deliver better patient care”, he said. As well as embracing technology, community pharmacy will have to change the way it operates to evolve and survive, Mr Donovan added in his session. “If hub-and-spoke is the right [dispensing] model for the future, then we need to make sure that both the hub and the spoke are registered pharmacies with a registered pharmacist”, he stressed. During the same interview, Mr Donovan also told C+D that Boots sees it as a “necessity” to have a pharmacy technician working alongside a pharmacist in every branch. Read more here. Are you embracing automation in your pharmacy? Automation for product selection is more accurate, providing product is in the right place of course. For FMD, decommissioning could take place at the hub at point of dispensing and checking as that’s when it’s allocated to the patient. A question - if the dispensed medicines are packaged and sealed at the hub and can’t be opened at the spoke, which pharmacist is accountable for the medicines being accurately dispensed? If more and more CCGs decide to block Boots from ordering repeat prescriptions their automated pharmacies (Dispening Support Pharmacy they call them) will collapse. The system only works if they can manage their workload by knowing when the patient is due their prescription so then they can send the prescription data to the offsite dispensing facilities before it is shipped back to the store in 2-3 days Imagine patients having to order their own prescription and then being told it be 2 working days because its being dispensed elsewhere. Even then some medication is not dispensed because they would run out of stock at the facility, which then the pharmacy would have to order and locally dispense the prescription. Wasting more of the patients times. FMD will also add another complication to the DSP model because the pharmacy teams are not allowed to open the sealed bags that the medications comes in thus making decommissioning very difficult. What did Boots say when the C+D demanded evidence of the safety improvements? 'Automation releases capacity to deliver better care'... roughly translated means 'Automation means more profit for Boots because it employs fewer people'. Ironically, the TUC are demanding that employers share the benefits of technology, by reducing the working week to 4 days but with no reduction in pay, rather than using it as a means to remove jobs.